On Saturday night, DiBella Entertainment returned to the Fox Theater at Foxwoods Resort Casino, in Mashantucket, CT, with another action-packed installment of its popular Broadway Boxing series, presented by Nissan of Queens, Azad Watches, OPTYX, and Christos Steak House. Headlining the event, Manchester, CT’s Matt “Sharp Shooter” Remillard, 129, lived up to his nickname, as he just could not miss against the tough-yet-stationary Mexican southpaw Yardley Cruz, 130, of Sacramento, CA. 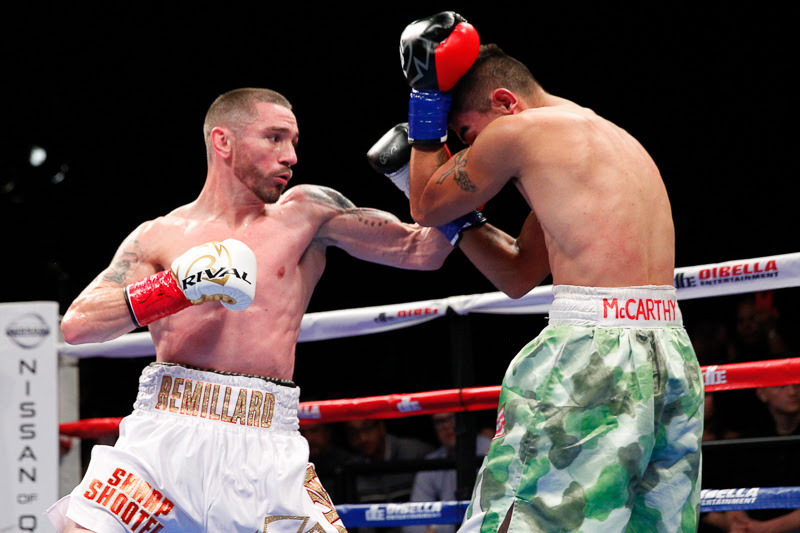 Once ranked #2 in the world before his loss to future world champion Mikey Garcia in 2011, Remillard’s edge in speed and power were on display as he picked up the third victory of his comeback that began in April of this year. Trained by Connecticut Boxing Hall of Famer Paul Cichon, Remillard proved to be effective at cutting off the ring and trapping Cruz in corners, tagging the midsection with stinging straight rights. As the bout wore on, the very accurate Remillard unleashed more of his arsenal, battering Cruz with uppercuts and straights that snapped his adversary’s head back. The punishment continued until the referee felt Cruz had taken enough, ending the contest at 2:31 of round four, awarding Remillard the TKO victory and improving his record to 26-1 (15 KOs). Cruz is now 22-9 (12 KOs). 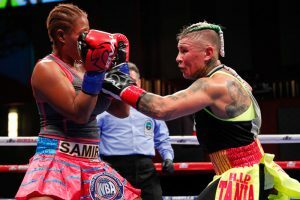 Making her ninth appearance at Foxwoods Resort Casino, women’s junior lightweight contender Shelly “Shelito’s Way” Vincent, 129, of Providence, RI, dominated the hard-punching, former world title challenger Calixta Silgado, 130, of Tolu, Colombia, over eight rounds. Vincent immediately worked her way inside and kept the fight at close quarters for the remainder of the contest, digging hooks to the body and head. Whatever leather Silgado threw, Vincent was able to easily evade by bobbing and weaving. Round seven exploded with fireworks, as Vincent and Silgado traded with abandon to the delight of the fans. Vincent controlled the action in the final stanza to claim a unanimous decision on scorecards of 79-73 twice, and 77-75, improving her record to 21-1 (1 KO). Silgado’s record fell to 15-9-3 (10 KOs). Now three fights removed from her only defeat, losing a decision in a heated battle against rival Heather Hardy in August 2016, Vincent has feverishly sought after a rematch of what was considered the “female fight of the year” by Ring Magazine. The 19-year-old “Marvelous” Mykquan Williams, 143, of East Hartford, CT, fought at Foxwoods for the eighth time out of nine professional fights and demolished southpaw Somner Martin, 144, of Martinsville, VA, in the opening stanza of a scheduled six-rounder. Williams pressed the action from the outset, landing punishing left hooks and short straight rights that had Martin in trouble and on unsteady legs, forcing a stoppage at the 2:19 mark. Trained by Paul Cichon and managed by the renowned Jackie Kallen, Williams upped his record to 9-0 (5 KOs). Martin’s ledger dropped to 7-6 (4 KOs). Williams was a decorated amateur with a 45-13 record, highlighted by three gold-medal performances at the Ringside World Championships, in addition to winning the PAL Tournament and Silver Gloves Championships. The popular Nicholas DeQuattro, 141, of Johnston, RI, and pro-debuting Andre Belcarris, 146, of Bennington, VT, engaged in an entertaining four-round brawl. Both DeQuattro and Belcarris dispensed with technique, intent on slugging it out and playing to the crowd with moments of flash and bravado. Belcarris, who entered the bout with an MMA background, was the aggressor early, though DeQuattro shot hooks downstairs that would tire his adversary later on. DeQuattro and Belcarris each landed wild haymakers in the third. A visibly winded Belcarris lost his mouthpiece twice in the final frame, as DeQuattro outworked him to win a unanimous verdict with tallies of 40-36 twice, and 39-37. DeQuattro, now 2-0 (1 KO), made his pro debut at Foxwoods on September 15, scoring a first-round knockout. Canadian middleweight contender Steve Rolls, 162, of Toronto, scored a highlight-reel knockout against Mexican Andrik Saralegui, 168, of San Diego, CA, in round three. Rolls dictated the pace, controlling the distance with a steady jab and expert footwork, never letting Saralegui in close enough to land solidly. Straight rights downstairs added to Saralegui’s discomfort over the first six minutes of the contest. A three-punch combination in the third, culminating with a devastating left hook to the body, sent Saralegui to the canvas in pain, and the bout was immediately stopped at the 2:17 mark. With the victory, Rolls improved his record to 17-0 (10 KOs). Rolls has had two impressive victories televised by Showtime’s ShoBox series. 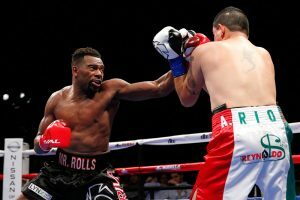 In December 2015, Rolls stopped the 9-0-1 Steed Woodall in four rounds, and most recently, he earned an eight-round decision win against the dangerous 17-1-1 Demond Nicholson on June 9. Before turning pro in 2011, Rolls had a very successful amateur career, competing on both the 2009 and 2010 Canadian National boxing teams, finishing with an 83-14 record overall. 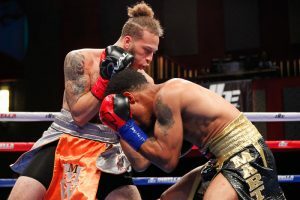 A 2016 New England Golden Gloves champion, welterweight Khiry “TNT” Todd, 146, of Lynn, MA, earned a unanimous six-round decision versus the experienced Evincii Dixon, 148, of Lancaster, PA. While Todd employed textbook boxing technique, pinpointing jabs to the body then following up with combinations upstairs, an apprehensive Dixon remained defensive-minded throughout. By the third frame, Todd was caving in Dixon’s midsection with vicious hooks. Scorecards read 60-54, and 59-55 twice, all for Todd, to improve his record to 6-0 (5 KOs). Dixon now stands at 7-21-2 (2 KOs). Ending an eight-month absence from the ring, Puerto Rican prospect Nicklaus Flaz, 156, of Bayamon, was taken the distance for the first time as a pro, battling a game Elie Augustama, 162, of Fort Lauderdale, FL, over six rounds. Flaz applied pressure at the start, finding a home for his straight right upstairs. When Augustama closed the gap, Flaz banged the body. In the third, Augustama was cut near his right eye as a result of Flaz’ consistent jab. Augustama had a late rally in the final frame, but Flaz closed the show landing counter shots to seize a unanimous decision on scores of 60-54, and 59-55 twice. Flaz, who was a three-time National champion as an amateur, compiling a record of 88-7, upped his pro ledger to 5-0 (4 KOs), while Augustama dipped below the .500 mark to 6-7 (3KOs). In his debut at Foxwoods Resort Casino, southpaw Hurshidbek Normatov, 158, opened up the card quickly dispatching of Toronto, Canada’s Bruce Lutchmedial, 159, inside round one. Normatov, born in Uzbekistan, but now living and training in Brooklyn with Andre Rozier, was the taller fighter and used his longer reach to keep Lutchmedial at bay with the jab. Backing Lutchmedial against the ropes, Normatov landed three right hooks to drop his foe. The same punch felled Lutchmedial a second time moments later and the bout was stopped by the referee at the 2:38 mark. Promoted by DiBella Entertainment and managed by David McWater’s Split-T Management, Normatov, who was an experienced amateur competing in 324 bouts and winning the 2014 European National championship, improved to 4-0 (2 KOs). Lutchmedial’s record is now 2-4 (2 KOs).